Two Happiness Engineers visit Brazil and receive the most overwhelmingly warm welcome. Karen Arnold and Erica Varlese work on the Happiness Hiring team at Automattic, where they hire new Happiness Engineers who support users on WordPress.com and Automattic products. 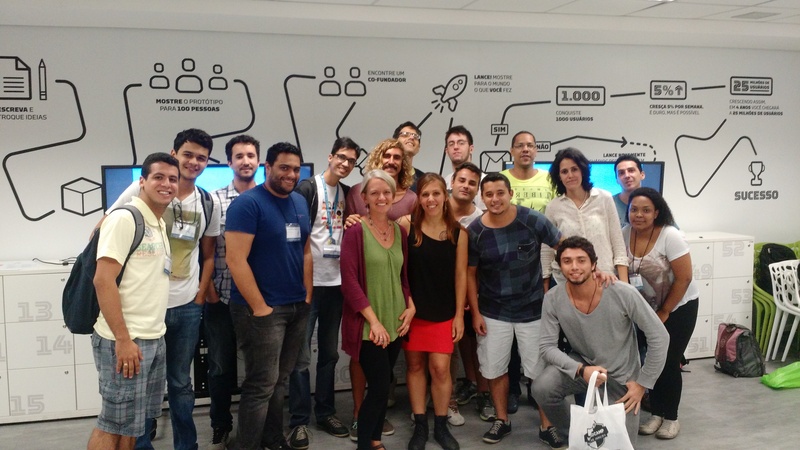 They met with the Brazilian WordPress community last week and wanted to share their experiences. 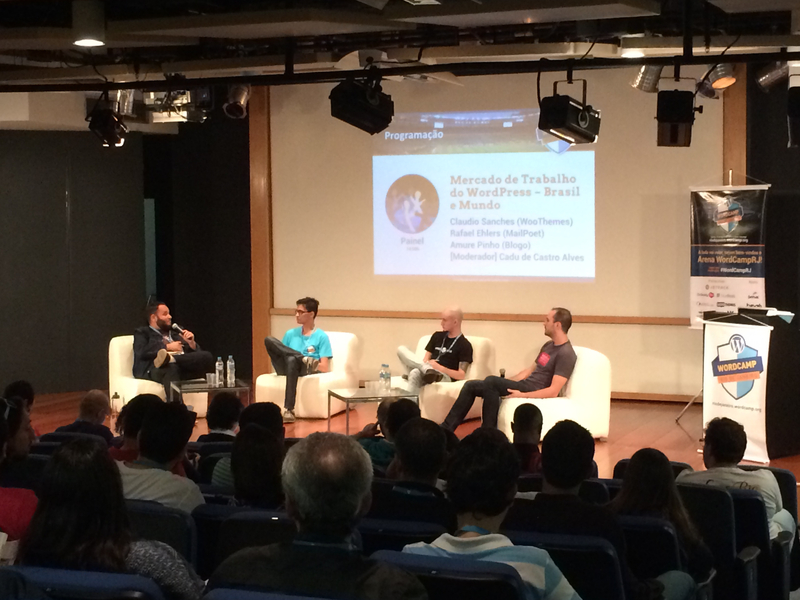 On August 29th, 2015, we traveled to Brazil to attend WordCamp Rio de Janeiro and meet the Brazilian WordPress community. At Automattic, the company behind WordPress.com, we’re working on localizing our support to those who speak Brazilian Portuguese. Since both of us are part of our Happiness Hiring team, which focuses on hiring new support engineers, or “Happiness Engineers,” we decided to travel to the WordPress community in Brazil to share our new Happiness Engineer (BR-PT) role and talk about our experience with support. At WordCamp Rio de Janeiro, we gave a talk on “Engineering happiness: bridging the gap between developers and customers.” Our talk, which will be translated to include subtitles, focused on tips and tricks from our experience on how to get into the right support mindset and how to use support to create loyal customers. 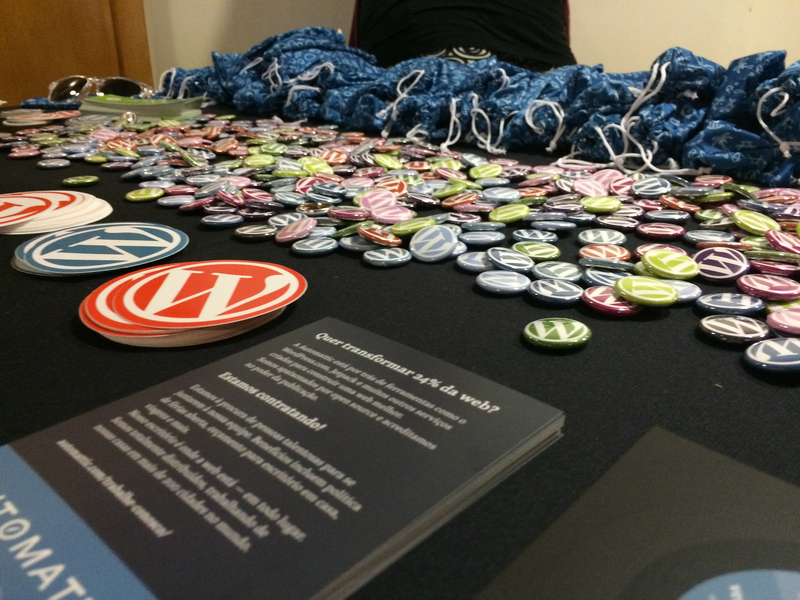 The audience was wonderfully responsive and we had the opportunity to chat with many WordCamp attendees about their thoughts on support, Happiness Engineering, and how education is a part of their day-to-day work with WordPress. After the WordCamp, we got the chance to cowork at a startup incubator, Espaço NAVE, which is part of Universidade Estácio de Sá. Here, students compete to share their startup and product ideas over the course of a semester. We gave our talk to the community at Espaço NAVE, focusing on the importance of support for all products and companies, not just WordPress. Later in the week, we traveled to São Paulo to meet with the local tech community, including Marco Gomes, the founder of boo-box, and WordPress community members. At the São Paulo WordPress meetup, we saw the incredible community dynamic in action as members shared thoughts and ideas on new topics and talks to cover throughout the year. Anyssa Ferreira gave an excellent talk on women working with WordPress in the Brazilian community before allowing us to take the stage to chat about support and localization. Our trip to Brazil was packed with tons of productive and fascinating conversations. We were welcomed by an incredibly warm and dynamic community. We’re excited to see the ongoing results of our conversations around localized support, women and children in WordPress, and the WordPress community in South America as a whole. Are you fluent in Brazilian Portuguese and English and love supporting users? If so, you might be a great fit for our Happiness Engineer (BR-PT) role. We’re also hiring dozens of other roles globally! Join our team! Where I place the community wordpress Peru? Them WP badges though!!! Wish I could get one! Keep your arm, you need it to type! You can find the positions we’re hiring for here. Well… congratullations for thr big happening. I didn´t get to know these information ahead of time. I´m a learner. My blog: https://sinapseslinks.wordpress.com/ is nine years old and i have published over 9000 posts. Please let me know how to get in touch with you people. I need all the help a can get. We now have a Brazilian Portuguese news blog https://br.blog.wordpress.com/ , where you can find out about upcoming events in Brazil. Be sure to follow it, as well as our Twitter/Facebook accounts (see the sidebar of the blog)! This is great! And it’s good to see that the WordPress community is growing so much in South America (me being from Bolivia)! Is there some way to get just news about new features or changes without getting all of the rest of this not so pertinent news? It’s not possible to receive only certain emails from the WordPress.com News blog, but you can adjust your email settings through your Reader so you can limit the frequency. Sounds like a fun time in Brazil! It is great to see WordPress expanding to South America. You can learn more about each of the positions we’re hiring for, and how to apply, through our Work With Us page. Erica, that event look fantastic! The opportunity to share knowledge with the blogger community of WP is an A+, plus there is a hiring opportunity open. Are you plan to coming soon to Florida? There is a group here? Verry interesting what i read here. Bom, suponho que você fale português e como esse post é associado a esse idioma, vou prestigiar a última flor do Lácio… O engine do WordPress é fantástico. Realmente muito bom. Tenho usado há alguns meses, para estudar junto com minha filha. Como eu e ela moramos longe um do outro, o WordPress (associado a outras ferramentas) tem sido fundamental. I’m glad to hear about more improvements regarding Brazilian Portuguese, keep on creating new features! Great job word press,u have done a great job ,by that which u have done ,kudos and keep it up. Amazing for WordPress company ! Thank you very much for your incredible service around the world ! Nice for the Brasilian communauty ! Hi all ! i love what you guys are doing Sound pretty good. I wish i had such a Chance, am very new to wordpress.com (clarachinyere.wordpress.com. I am still working on my Topic ” you have a dream , be persistent. Will notify you if you dont mind.